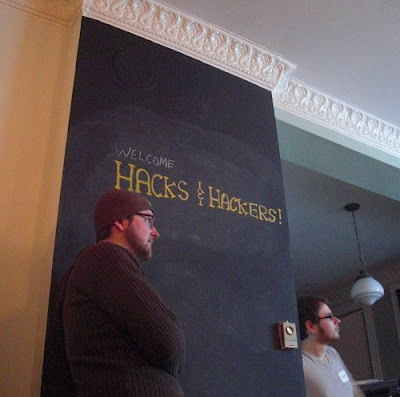 Last night I went to the second Hacks/Hackers Toronto Meetup, it's a gathering of hacks (writers) and hackers (technologists): "journalism meets technology." I had a blast talking to a bunch of people and my Heart Spark was also a huge kit. There was a lightning talks part of the evening, which was super awesome. I was most impressed by the MyTTC guys, who showed some epic visualizations of public transit vehicles moving through the city. Next most awesome down the list was remembrance day by Open File, they manually entered data about 3300 WWII soldiers who died during the war and left next of kin in Toronto. You can browse around the map and see how it affected your neighborhood, which is just such an awesome way to remember the dead. After the talks we moved to a nearby bar and chatted till about midnight, which was super fun. I met some great people, although not as many this time as at the last hacks/hackers meetup, when there were no talks to distract us all :).